Markets. In fine art circles this seems to be a bit of a dirty word. Artists seem to be expected to produce art for a year or so, pay for all of their living expenses, art materials, the cost of professional framing of all the works worthy of showing (and discarding all the failures), book an exhibition at least six months in advance and then either split the sale price of the art with the gallery or pay an exhibition hire fee and still split the sale price of the art. Is it any wonder the archetype of the starving artist is so widely known? For artists early in their career under this model there is little choice but to starve or work at the art on the side. This is true even for mid career artists under this model. But this model is not the only way. Artists can find ways to sell their work direct to the people who appreciate it. The internet is here. And so are Makers Markets. I choose the new way. While I am early in my career. While my prices are still very very affordable. I choose to go to quality art and craft markets. To get out there, to meet and talk with the people who are taken by my art. The feedback is invaluable. The chats are fun! I get a chance to be in charge of my destiny instead of waiting to be 'discovered'. More people get to know what I do. I get a chance to make a living. 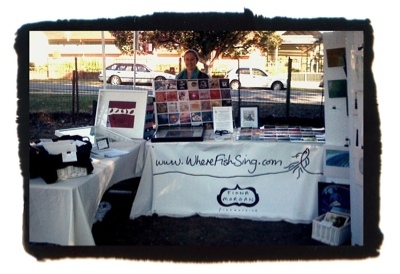 This past weekend was my first outdoor market experience. Bellingen Community Markets. There were a tonne of people, the weather was glorious and despite all the traders I spoke to saying the day was slow trading, I covered the cost of the stall and made a big dent in the costs of my preparation for outdoor trading. I'd had to purchase a gazebo, several trestle tables and numerous presentation bits and bobs. Another slow trading day and I'll be in the black on this front. The stall setup needs some tweaking to deal with gusts of wind. The layout will evolve to be more enticing and easy to understand at a glance. It wasn't a perfect start but it was a great step in the right direction. I'll be back for more. Already I'm making inquiries regarding the Bellingen Growers Market, the Coffs Harbourside Markets and Port Macquarie Foreshore Markets. I may not end up at all of these. I may pop up at others as I discover and experiment. If you're on the mid north coast of New South Wales you are probably going to run into me at some point. My plan is to present my work at these higher quality makers markets for a year or three and see where it leads. It's not where I see myself in five or ten years time. It's a stepping stone up the ladder. At some point my work will be too expensive to sell at markets and other opportunities will arise to replace them. Until then, I'll see you on a grand day out in the sunshine, sipping coffee and wandering the stalls. How to make a living as an artist? Take matters into your own hands.